Nick Chopper, who followed in his father’s footsteps, made a living cutting down trees throughout the forests in the magical land of Oz. Once, his heart belonged to a beautiful Munchkin maiden named Nimmie Amee. They were both so in love that they planned to marry until the spiteful woman who Nimmie Amee served bribed the Wicked Witch of the West to put a horrible spell on the axe of the Munchkin maiden’s beloved woodman. Why would the old woman request such a terrible thing from the Wicked Witch? Because the miserly crone wanted to keep Nimmie Amee all to herself as a servant. The Wicked Witch obliged the old woman’s bride and enchanted Nick Chopper’s axe to prevent the lovers from becoming betrothed. Nick’s axe, under the spell of the Wicked Witch, one by one chopped off his arms and legs. The tinsmith known as Ku-Klip replaced the woodman’s limbs with prosthetic ones made out of tin. After the gruesome deed was finished, nothing remained of the poor woodman’s body. Nick Chopper was replaced entirely by tin except for one thing….. his heart. Ku-Klip failed to replace it. Once Nick’s body was completely made out of tin, he was no longer able to love Nimmie Amee. As the story goes in The Wonderful Wizard of Oz written by L. Frank Baum, the tin woodman is befriended by a sweet, young girl named Dorothy and her little dog, Toto. She discovers him in the forest rusty and unable to move. With the use of his oil can she’s able to release him from his paralyzed state. Elated, the Tin Man follows Dorothy’s lead to the Emerald City so he can ask the Wizard for a new heart. Along their journey they are joined by two others, the Cowardly Lion and The Scarecrow. Upon their arrival to the Emerald City, the Wizard sends the four travelers to Winkie Country where the Wicked Witch of the West lives and kill her. The Tin Man’s axe becomes quite useful during their quest, not only for chopping wood to build bridges or rafts when needed, but the enchanted blade proves worthy for cutting off the heads of animals that try to harm the Tin Man and his friends. The Wicked Witch sends her dreaded winged monkeys to attack them. Then they grab the Tin Man and from high above, the evil monkeys purposely drop him causing his landing to be brutally damaging to his body. After the fight was over, Dorothy and the others are able to bring on the Wicked Witch’s demise. That’s when the Winkie Country’s tinsmiths are able to repair our beloved Tin Man. … and Dorothy wanted to go back home to her Auntie Em and Uncle Henry. 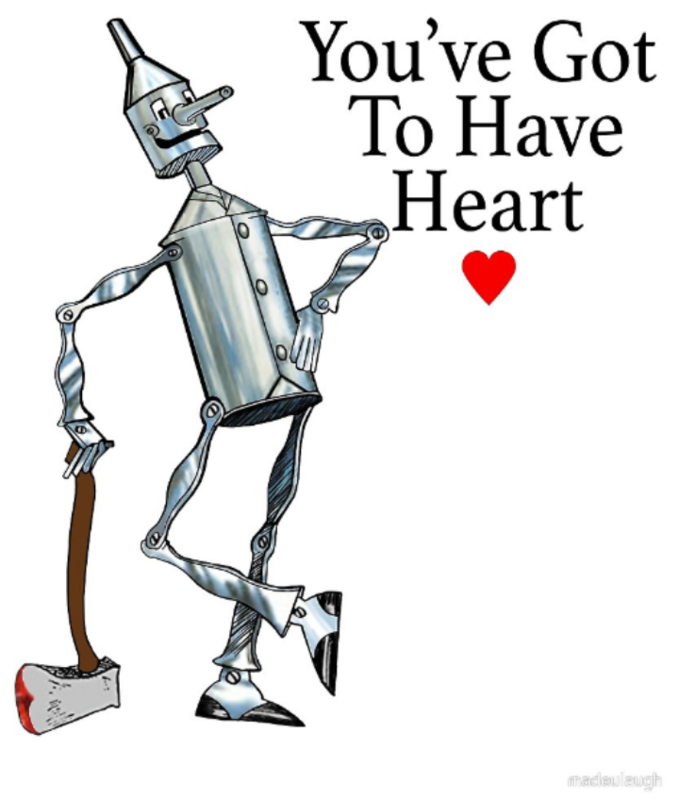 The Tin Man wanted a heart, but the Wizard, not being as powerful as he originally portrayed, was only able to give the Tin Man a placebo heart created from a silk pouch that was filled with sawdust. Believe it or not, this satisfied the Tin Man, who actually was the kindest of Dorothy’s friends. After Dorothy returned home to Kansas, the Tin Man went to Winkie Country where he became the emperor. As time went by, he had his subjects build his palace completely out of tin, even the flowers in the garden were made from the shiny material. So, a bizarre tale for a man who only wanted to marry his true love. Throughout my life I’ve always been such a fan of The Wizard of Oz, but honestly did not know of the extremity of how the woodman became our beloved Tin Man. “Wow!” Is all I can say…. This entry was posted in Artist, Author, Books, Dorothy, Emerald City, Entertainment, Fantasy, Flying Monkeys, Heart, Kindle, Ku-Klip, L. Frank Baum, Munchkins, Nick Chopper, Nimmie Amee, Paperback, Paranormal, Paranormal Researcher, Poet, Sheila Renee Parker, Supernatural, The Cowardly Lion, The Scarecrow, The Spirit Within, The Tin Man, The Wicked Witch of the West, The Wizard, The Wizard of Oz, Tinsmith, Toto, Winkie Country, Woodman, Writer and tagged Artist, Author, Books, Dorothy, Emerald City, Entertainment, Fantasy, Flying Monkeys, Heart, Kindle, Ku-Klip, L. Frank Baum, Munchkins, Nick Chopper, Nimmie Amee, Paperback, Paranormal, Paranormal Researcher, Poet, Sheila Renee Parker, Supernatural, The Cowardly Lion, The Scarecrow, The Spirit Within, The Tin Man, The Wicked Witch of the West, The Wizard, The Wizard of Oz, Tinsmith, Toto, Winkie Country, Woodman, Writer by SheilaReneeParker. Bookmark the permalink. It’s always fun learning “behind the scenes” things. lol…. Glad you enjoyed reading it, Jim! An interesting and entertaining tale! In the Tin Woodman of Oz, Nick Chopper finally goes looking for the girl he once loved. Doesn’t get her though. She has a “meat” husband, made of the different parts of Nick Chopper and the TIn Soldier. Nick Chopper’s head is kept in a cupboard and is really rude. I’ll be honest, this is the least favorite of Baum’s books for me. He had so many ideas – The Gump, The Hungry Tiger, the Gnome King… This one is one I just don’t love. I can understand why. Thank you for sharing, Liz! I only even read The Wizard of Oz for the first time this year (the movie scared the hell out of me as a kid) and found the Tin Man story really upsetting! Agreed… The Tin Man’s story puts a completely different perspective on things. It tripped me out!